Last week was fairly positive for equities. 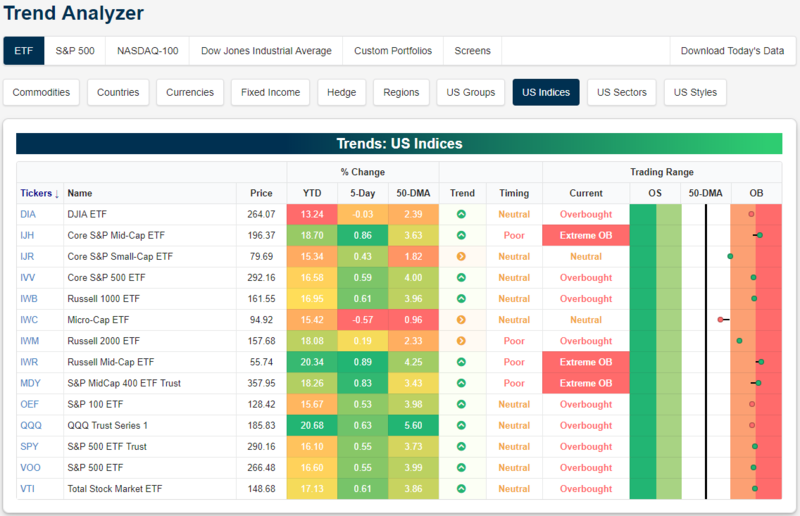 As shown below, all but two of the major US index ETFs we track with our Trend Analyzer tool were up on the week. Given overbought/oversold levels, it makes sense that the indices did not rocket higher. Things have gotten pretty overbought across the board, especially for mid-caps. Twelve of the fourteen major index ETFs are now overbought with each of the Mid Cap ETFs (IJH, IWR, and MDY) all at extreme levels. These ETFs also outperformed their peers last week. Large and small-caps are on the verge of also becoming extremely overbought. Only the Core S&P Small Cap (IJR) and Micro-Cap (IWC) have been lagging behind and are still neutral, granted IJR is on the border of moving into overbought. Start a two-week free trial to Bespoke Premium to access our interactive Trend Analyzer tool and much more.